Despite the development boom that has exploded in Bonney Lake and along nearby sections of State Route 410 over the last few years, families in the area have typically had to head down off the plateau (or north to King County) to find indoor play options for their children. With the opening of Kidz Happy Hour in November, however, there is now a local option right in town for rainy-day fun — plus it serves the local community as a birthday party venue. Kidz Happy Hour has all kinds of kid favorites. A multi-level climbing structure that leads to assorted slides, chutes, ladders and foam-padded obstacles. These all elicit giggles, plus challenge little ones to problem-solve their way out. One route leads young explorers to a platform with a giant Connect Four game. We also found colorful punching bags and hanging balls to dodge or swing from, plus bungie-corded foam swings to sit and bounce on. My older child needed to be coaxed off the zip line while my younger one got happily dizzy in one of two spinning teacups. 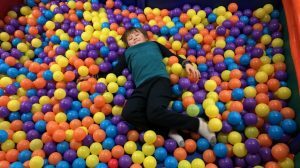 Don’t miss the ball pit! For crawlers and toddlers, there is a designated enclosed area featuring colorful foam blocks and pads to touch, climb on and explore. The space is intimate enough that parents who bring more than one child can easily sit with their little ones while keeping an eye on the older kids playing nearby. Kidz Happy Hour has two rooms designated for parties. Pricing options range from $200 to $300. More information can be found on the website. Taverna said they hope to offer themed activities later on and are also looking to add an interactive floor or wall games that have become popular at some area play spaces. The space is intended for kids ages 10 and under. Keep in mind the entire space is small enough that with such a wide age range of kids scrambling inside the climbing structures, it’s still a good idea to watch your children if they’re on the small side. Kids need socks to play, and they do sell socks if you forget them. While Kidz Happy Hour has signs indicating “No outside food allowed,” Taverna clarified that kids’ snacks and drink bottles prepared at home are fine. Staff will enforce the rule, however, if patrons are bringing in full meals or food purchased at nearby restaurants (e.g. Subway next door). Small snacks and drinks are also available for purchase at the front counter. There are benches and counters with seats available for parents to use, as well as free wifi. Storage cubbies are also available. Restrooms are fully equipped with stools and changing tables. On our visit, the staff had “Moana” and “Trolls” playing with the sound off on a nearby TV. Both my kids got comfortable in the climbing structure and sat there watching the movies that we already have at home. Standard admission fee is for 90 minutes of play. If families need to step out, staff will do their best to accommodate their return, on a case by case basis, Taverna said. If you need to leave within your 90 minutes and plan to return, definitely check with staff first.